I was in high school when the first iPods and other MP3 players arrived. At that point, they were still a novelty. Typical consumers were not aware that CDs were about to be replaced by a new format and that people would be buying, sharing and consuming music in a new way. Even as these devices improved in price and function, I was still hesitant. I clung to my stacks of jewel cases, and convinced myself that people would tire of the lesser sound quality of the ethereal MP3 and the introverted selfishness implied by wearing ear buds. I liked having a tangible item of music with paper album covers. I liked sharing music openly with friends. Then again, I am not a Luddite. I also liked the idea that I could back up my music as many times as I wanted and carry all of it anywhere. I liked that MP3s are cheaper; you don’t have to buy a whole album for one song. On a shopping trip three years ago, I happened upon some recently-recorded 180 gram LP records. The records are perfect for an audiophile, and many included a voucher to download the MP3 files. After this discovery I only bought these music products, but they were few and far between. As a result, I stopped buying music all together. I was in music limbo, so I began migrating all of my CDs to the digital format. When I became pregnant, I decided to get an iPod to make playlists for the delivery and labor (sidenote—this never came to fruition). After my baby was born in March, my husband convinced me to sell all of our CDs to make much-needed room in our home. The process was cathartic. Just a few of the Performing Arts Directory artists you can find in the ether. Today I buy MP3s exclusively. Many music lovers came to this conclusion years ago. If you are a fan of Kentucky performers, then rest assured that your favorite artists have evolved right along with you. 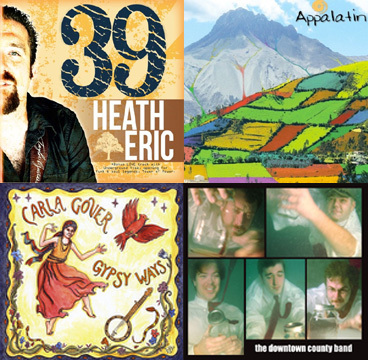 Carla Gover, Appalatin, Heath Eric, Juggernaut Jug Band, Downtown County Band and Lorinda Jones are among the arts council Performing Arts Directory artists that can be found on iTunes or CD Baby. If you’re still holding fast to paper liner notes, don’t worry. We will be waiting here for you.